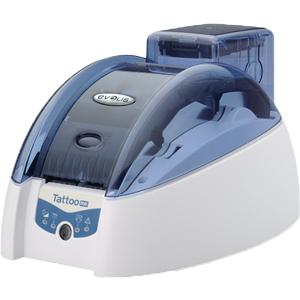 The Tattoo Rewrite is designed to print on rewritable cards, allowing erasing and reprinting on the same card hundreds of times. Rewritable cards are very popular in Japan and other Asiatic countries where they are used in many Point of Sales applications. The Tattoo Rewrite is derived from the Evolis Tattoo and looks very similar, but the printing process is completely different. Its compact and sleek design makes it the ideal equipment to integrate and use in multiple environments: offices, reception desks, point of sale, etc..
Rewritable printing technology does not require a ribbon to personalize cards. The card itself holds a thermosensitive material that turns visible when heated to a temperature of 356° F (180° C) and then rapidly cooled. The application of a lower temperature, generally in the 230-320° F (110-160° C) range, will erase any colour pattern. This process alters two chemicals that interact with each other according to selected temperature thresholds. This heating/cooling process is handled thanks to a thermal head, similar to the one used in the Evolis printers. Note that this process can be rolled back, allowing the same card to be reused and reprinted many times.